Revenue jumped 54.5 per cent to Rs 156,291 crore. 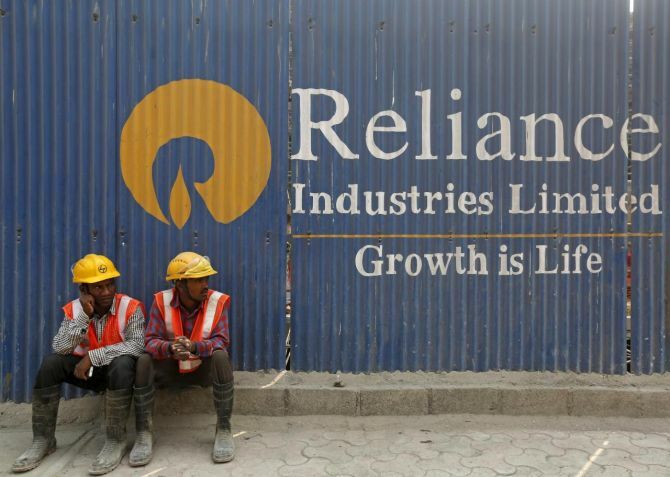 Reliance Industries on Wednesday reported its highest ever quarterly net profit in July-September as record earnings from petrochemical business and bumper earnings from retail business and telecom arm made up for a decline in refinery margins. The oil-to-telecom conglomerate also announced an acquisition of majority stakes in Den Networks Ltd and Hathway Cable and Datacom Ltd for Rs 5,230 crore to bring under its fold 27,000 local cable operators who would help strengthen its rollout of fibre-based broadband service to households for offering ultra high definition entertainment on large screen TVs. Reliance Jio, the group's telecom arm, posted a standalone net profit of Rs 681 crore, which was 11.3 per cent more than the previous quarter as subscriber base swelled to 252.3 million. The operator of world's largest oil refining complex saw pre-tax earnings from the business decline for the second quarter in a row. It fell 19.6 per cent to Rs 5,322 crore as margins dipped. In the first quarter the pre-tax earnings had fallen 16.8 per cent. It earned $9.5 on turning every barrel of crude oil into fuel as compared to a gross refining margin of $12 per barrel. The GRM was also lower than $10.5 per barrel earning in first quarter. With telecom continuing to drain investments, Reliance said its outstanding debt rose to Rs 258,701 crore as on September 30 as compared to Rs 242,116 crore on June 30 and Rs 218,763 crore on March 31. Cash in hand was marginally declined to Rs 76,740 crore, from Rs 79,492 crore in the previous quarter. Commenting on the results, Mukesh D Ambani, chairman and managing director, Reliance Industries Ltd, said: "Our company delivered robust operating and financial results for the quarter despite macro headwinds, with strong growth in earnings on a year-on-year basis." "Our integrated refining and petrochemicals business generated strong cash flows in a period of heightened volatility in commodity and currency markets," he said. "Our world-class petrochemicals assets contributed to record earnings; endorsing benefits of diversified feedstock, integration and superior product portfolio. “Use of ethane feedstock at Nagothane cracker from this quarter has further enhanced feedstock optionality." Stating that the group's consumer-facing businesses were gathering momentum, he said the performance of both retail and Jio reflect the benefits of scale, technology and operational efficiencies. "Retail business EBITDA has grown three-fold on Y-o-Y basis whereas Reliance Jio EBITDA has grown nearly 2.5 times. “Jio has now crossed 250 million subscriber milestone and continues to be the largest mobile data carrier in the world," he said. Net subscriber addition for Jio was 37 million in July-September, as against 28.7 million in the previous quarter. The Average Revenue per User (ARPU), however, declined to Rs 131.7 per subscriber per month from Rs 134.5 in April-June. RIL said it will make a "primary investment of Rs 2,045 crore through a preferential issue under SEBI regulations and secondary purchase of Rs 245 crore from the existing promoters for a 66 per cent stake in DEN". Also, it will make a primary investment of Rs 2,940 crore through a preferential issue for a 51.34 per cent stake in Hathway. RIL would also make open offers to minority shareholders of GTPL Hathway Ltd, a company jointly controlled by Hathway with 37.3 per cent stake, and Hathway Bhawani Cabletel and Datacomm Limited, a subsidiary of Hathway, the statement said.